If you have good height your personality naturally become more attractive and noticeable in the crowd,without good height your personality is incomplete and less attractive.Today mostly peoples have short height and spend big amount of money on diffrent kinds of products and medicines for increase there height but no one trying to understand the root cause of this problem.There are many reason behind short height problem. Heredity Problem - Your father,grand-father or mother are short in height. Poor Diet - Because of poor diet,lack of vitamins,minerals,protein may effect your height and other body development. No Physical Activity - Physical activity is very important for overall body development and height. These are some bacic causes of short height,but if you try you can increase your height by doing some simple things before age of 24 because this is the main time period of body development. Start Workout - Do some physical activity like running,jumping,stretching,rope jumping etc. Eat healthy diet like food high in protein,minerals,vitamins,fibers etc. Hanging is good for increase height. 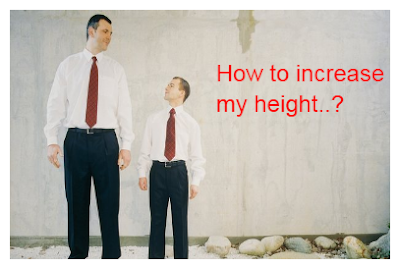 Very effective for increase your height in a natural way. Important - Remember one thing,if you are doing gym and lift heavy weight please avoid squats with heavy weight,take free weight squats.Take all over-head movement in sitting position avoid standing positions specially for over-head movements like over-head dumbbell,shoulder road because it compresses the spine which effect your height.After over-head movements or free weight squats go and hang from a bar to let the spine stretch out back to normal.